DETROIT: Far East Southwest ?? 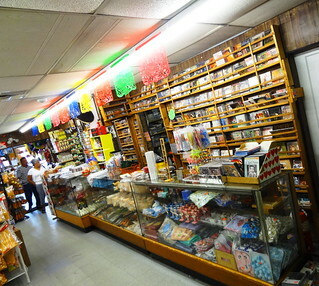 Today we are in East Southwest Detroit; the tiny section of Mexicantown east of I 75. 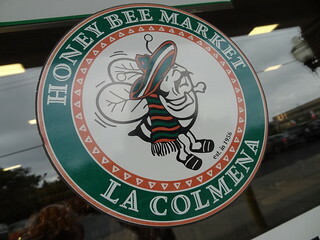 I need a few things from the store so our first stop is Honey Bee Market . 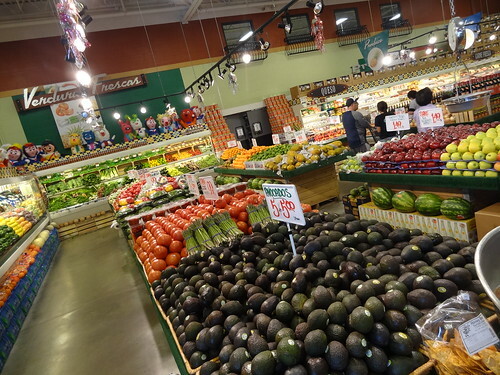 There are so many things I like about shopping here: the space is brightly lit, pinatas fill the top shelves surrounding the aisles, produce is fresh, colorful; my favorite thing, of course, is the guacamole. 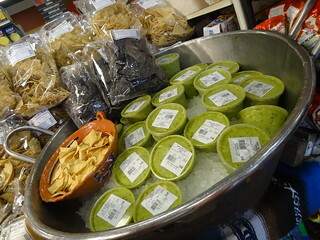 As soon as I step in the door, tubs of guac, pico and salsa are being chilled on ice, bowls of chips are plentiful, allowing one to sample freely. If you can walk away without a bag of chips and a container of dip, you have much more willpower than I! 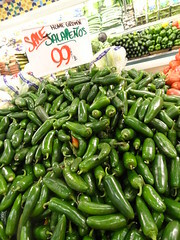 Avocados and tomatoes are piled high next to tomatillos and jalapenos, in case you’d like to make your own tasty dip. 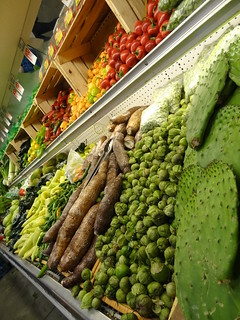 The first section is venduras frescas-fresh vegetables, along with everyday items, you will find a huge assortment of peppers, varieties of cactus pieces and yucca root; it’s all so appealing. Cheese is next; it’s fun to try a different kind from time to time, haven’t found one yet that isn’t tasty. Corn chips come in blue, salted or unsalted, the list of tortillas is long; flour, corn, crunchy, soft, in a multitude of sizes. Thirsty? How about some coconut or cactus water? If you’re looking for something fruity try a juice or nectar from Jumex or a Jarritos Mexican soda; hibiscus, strawberry and tamarindo are just some of the thirst quenching flavors. Signs hanging from the ceiling are written in Spanish and English, brings back a little of my high school Spanish; funny how some things stay with you. The meat counter is huge; beef, chicken, pork, marinated or plain. The chorizo is made from scratch using a secret family recipe; try it in tacos instead of ground beef-yum! 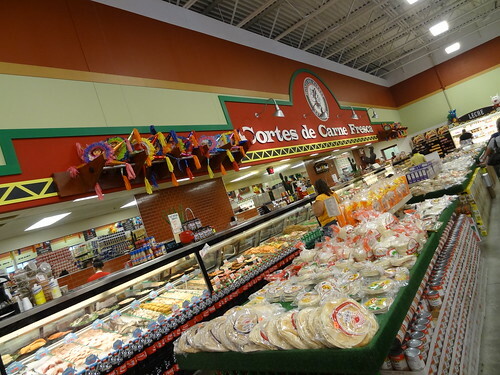 The store is filled with Central American ingredients; beans, mole, dried peppers, unique spices…..this aisle smells so good. Much of the packaging is written in Spanish, many have their own characters affiliated with the product; a cute little bear adorns cookie and snack wrappers. Prepared foods are available for take-out or you can eat at one of the picnic tables in front of the store, they also carry items from Michigan’s own Calder Dairy including ice cream and the most incredibly delicious chocolate milk you will ever drink…….just sayin’. I check my list before we check out to make sure I have everything; we’re good to go. 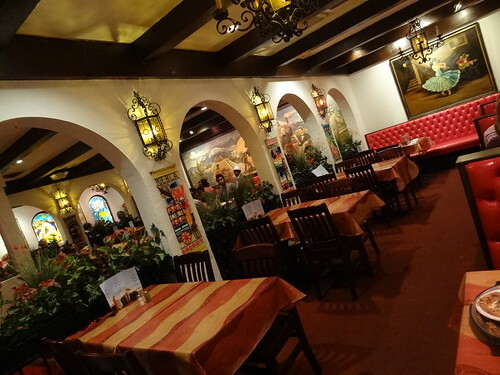 Looking at all that good food has given us quite an appetite, Mexican Village is just down the street, sounds good doesn’t it? 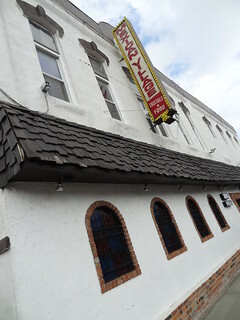 This is the oldest Mexican restaurant in Mexicantown, it definitely caters to area visitors. Inside, a beamed stucco ceiling, archways and wrought iron sconces and chandeliers are intended to put one in the mindset of Mexico; it’s lovely. The space is large, yet charming; murals and sizable paintings fill the walls, there are several dining areas in addition to banquet rooms. As we are led to our seat servers carry trays of chips and salsa to surrounding tables, the menu is vast, filled with mouth-watering selections. 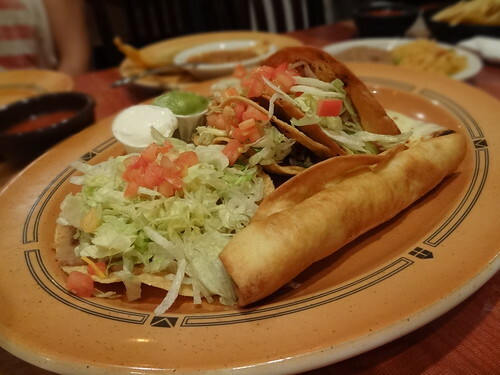 The best way to try a bit of everything is a combination plate; once our order is taken, we have to restrain ourselves so we don’t fill up on chips and salsa; not an easy task. Food arrives quickly, the village combination comes with 2 beef tacos; one flour, one corn, a chicken flauta, bean tostada and cheese enchilada. We also asked for a tamale, rice and beans. Everything is tasty; we both agree we like the cheese enchilada the best. 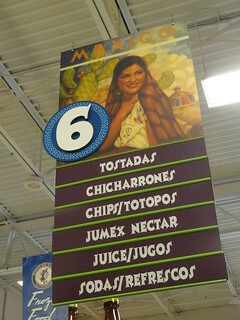 There’s a neighborhood market right next door: Algo Especial Supermercado; we take a peek inside. 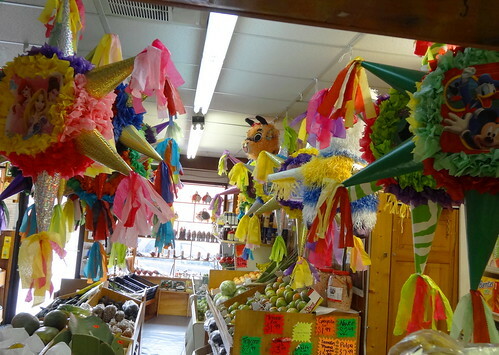 There’s a little bit of everything tucked into the narrow space; souvenir-type items, trinkets, produce and tortillas greet us near the door, along with festive pinatas that hang from the ceiling. Up a couple of steps, a small area is host to CD’s and DVD’s by Mexican artists, lovely, authentic costumes hang from a rack, American and Mexican flags are side by side. Just a little further you’ll find the meat counter, household items and the noteworthy tamale counter; be sure and take a few home. 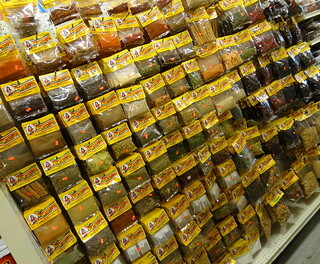 We walk back to the front passing tons of loose spices and teas, many I have never seen before. It’s always a fun adventure when exploring another culture! 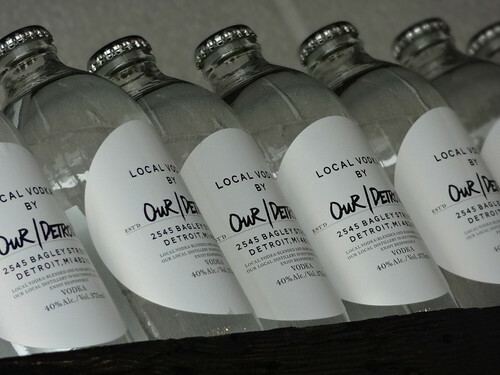 Until recently, Detroit hadn’t distilled a drop of spirits since prohibition; next we are stopping in at the city’s newest vodka producer, Our/Detroit. 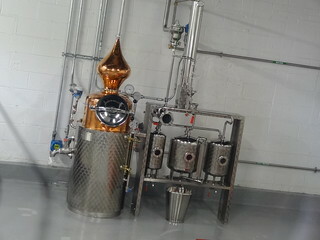 Partners Kate Bordine and Sara Aldridge have teamed up with Pernod Ricard Vodka, who supplies the recipe and distillery. The all-female-owned and operated end of the business is in charge of sales, marketing and most importantly production. This is global vodka made by local partners, using local ingredients, giving the spirit a unique taste from city to city. In Detroit, cocktails are created using products from local businesses such as Mc Clure’s, Mc Clary Bros. and Wolf Moon Mixers; it never ceases to amaze me the way in which the business community here supports one another! The building itself was formerly the Bagley Billiard Center, it sat vacant for a number of years before its current incarnation as distillery and tasting room. 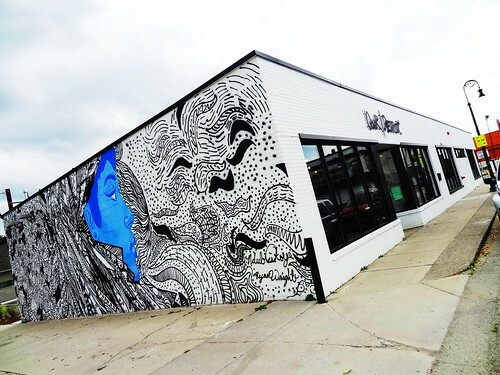 Fresh white paint and a cool mural by Ndubisi Okoye covering one side of the structure peak the curiosity of passersby; many peer in the front windows to see what’s going on inside. The decor is simple and elegant in black and white, art is the work of local artists. 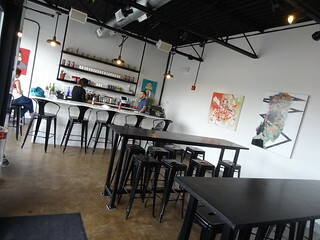 The tasting room has a chill vibe, shelves are filled with bottles of vodka and mixers, a well-placed window affords patrons a view of the working distillery. 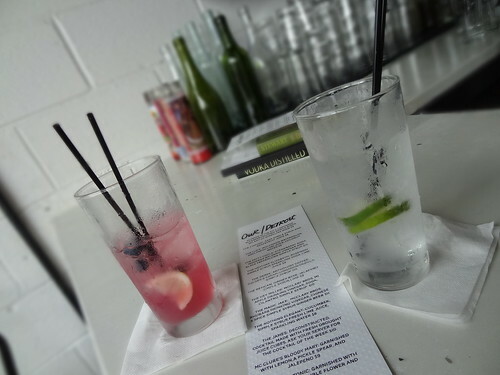 We sit at the counter, glancing at the menu, it doesn’t take long to decide, I’m having a vodka tonic with lime and Kris is having Summer in the City, a refreshing combination of vodka, lemonade, blueberry-nutmeg simple syrup and a splash of sparkling soda; it tastes even better than it sounds. The drink menu is seasonal, it will change quarterly; can’t wait to try out Autumn’s offerings!